The Wolverine starring Hugh Jackman is set to debut on July 26th, and it looks like the movie has teamed up with Red Robin to provide patrons with a tasty treat that is sure to awaken the Weapon X within us all. I recently took a trip with my father to Red Robin and, being an avid fan of Wolverine, I was obligated to get the limited Berserker Burger. The Berserker Burger is a fire-grilled burger topped with aioli, spicy pickles, Sriracha onion straws and cheddar cheese on a brioche bun. I was quite pleasantly surprised to see that the bun had three indentations on it, which, of course, represent marks from Wolverine's signature adamantium claws. The wooden Wolverine pick that held the burger together was also a very nice touch. 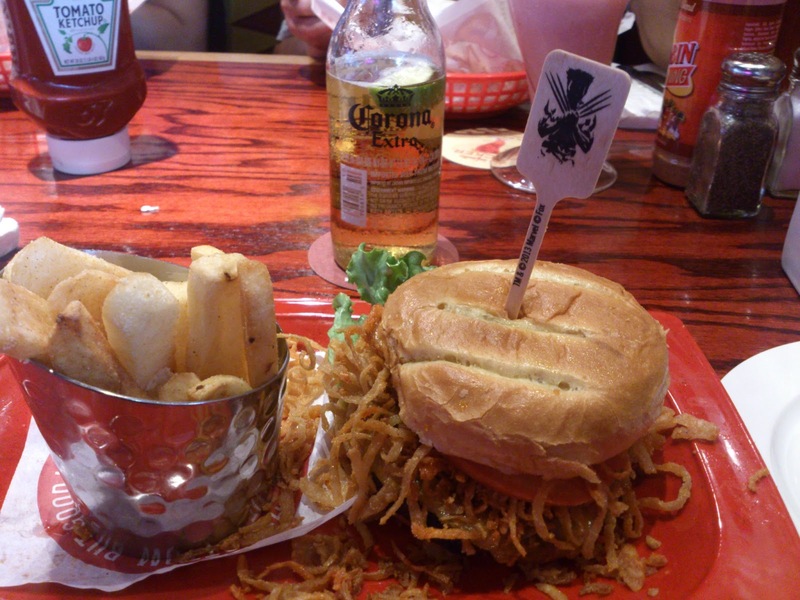 Red Robin certainly has a way with burgers, and it was most certainly the case with this invention. The taste and texture of the burger worked out beautifully with a nice combination of spicy and sour flavor. I did expect a little bit more of a kick to the sandwich, though, especially with the Sriracha onion straws. It probably would have been absolutely perfect if they were a little more generous with the sauce. Overall, the burger itself was a very nice and manageable size. It filled me up just fine, and it went great with a bottle of Corona Extra. So, if you're looking to mix things up or nerd out the next time you're out to eat, I'd definitely recommend the Berserker Burger at Red Robin. You won't flamin' regret it, bub.